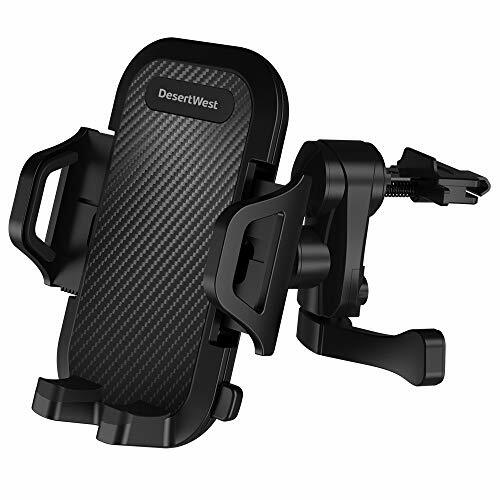 Cell Phone Mount for Car - Compatible with Iphone or Androids just $5.59! GREAT Stocking Stuffer! Cell Phone Mount for Car – Compatible with Iphone or Androids just $5.59! GREAT Stocking Stuffer! Pay just $5.59! Apply coupon code QSSH7HH4 at checkout. DesertWest Car Phone Mount Air Vent Phone Holder for Car Adjustable with 360 Degree Rotation, Compatible iPhone X/8/7P/ 5SE, Galaxy S6/7 Note 8, Huawei, Other Smartphone. § 360 Degree Rotation: The vented car mount has a 360-degree rotating head that allows you to adjust your viewing angle for safer driving. The maximize flexibility got the best view of safe driving, whether you are talking, navigating or listening to music. § Environmental Materials: This mobile phone holder adopts high-density ABS environmental protection material, which is harmless to the human body and does not cause pollution to the environment at the same time. § Extensive Compatibility: The air vent mount holder is compatible with all cell phones or GPS navigation between 4-6 inches. Such as the iPhone X/8/7/6plus, 5/5s, SE/4, Android cell phones Samsung Galaxy S8/S8 Plus, Huawei Mate/honor series,Google Pixel and GPS devices. § One-button Operation: With the quick release button, the phone can be easily inserted and released quickly, making driving easier and safer. Thus means you can operate it with one hand. Press the button on the side of the device to slide open and then remove the cell phone. Press the arms on both side to clamp mobile phone again. § Protect Yourself And Your Phones: Special lock design to ensure that you are safe in the course of driving, while protecting your mobile phone from scratch. In addition, we have provided you with a 24 - month worry-free service. GO NOW! Many Colors! 2 PC Curtains $3.99 SHIPPED!